OK there is a few questions in the passage above but this month the challenge question is what do you call yourself and why? Hopefully this will have everyone scratching their head but if you don’t like the challenge question you can elect to use the colour scheme instead. The complete texte is here. Yes, the question had me scratching my head. Thank you Sharon! What do I call myself? Apart from a woman, I find the answer difficult. I'm certainly not an artist: although I need playing with needles and thread on a daily basis, I'm not as creative as I'd wished. And I don't think enough on what I do to call me an artist, not to mention the lack of technical skills. 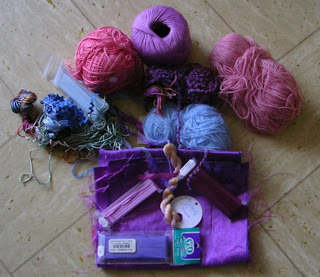 Textile art is a hobby, or a way to relax and to feel connected to other women of todays or of the past. Of today because this hobby lets me meet wonderful women, mainly in the cyberspace. Of the past, because we carry on techniques women have developped before us. However, my job takes the greatest part of my time, and I like that job. But that's not a job that will save the humanity, just enable me to raise my kids properly and do a living. Well, if I cannot put words on what I am, I certainly cannot represent those words with threads. It would have required a lot of thinking which I was not ready to make this month. So I went for the second option, with those threads: I found it was a good opportunity to try lock stitch as described by J. Beaney and J. Littejohn. 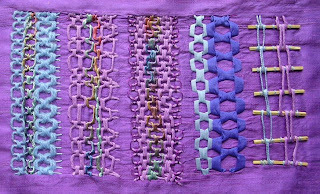 Lock stitch sampler, on silk, embroidered with fancy threads, wool, silk ribbon, matches. My main problem has been the loop. I wanted to use this fabric, but it requires a loop. And to move the loop as I went on, twice for each layer of each colum. I saw one a square loop, and I wished I had one! But I definitely love this stitch. It is as verstile as they say. Fascinating piece--so many interesting variations on the stitch with your different threads and the sticks at the end. I use stretcher bar frames more than hoops. These frames allow me to see the whole design or work area at once. No doubt you can find them in France. Here are smaller stretcher bars for smaller frames. Look for mini stretcher bars. Liebe Vero, na, das ist doch eine Deiner leichtesten Übungen, das sind doch genau Deine Favouriten-Farben?! Die Stiche sind wieder ein absolutes Gedicht und es ist ja eine sehr positive Energie darin, nicht umsonst nehme ich Deine Tasche immer dann, wenn ich wichtige oder schwierige Gänge vor mir habe. That's an interesting stitch, first time I'm seeing it. Must try it out. I'm sure it will feature in the take a stitch tuesday which is being revisited on stitchin fingers. Everyone who's taking part in TIF is also a member of stitchin fingers - what a great forum for so many like minded people.